These highlights chronicle the year 2018. Created incrementally as new photos were available, the year runs generally "backwards" on this page. Unlike earlier years, many highlights have been limited to the exceptional rarities. The abbreviation "MTY" means "Monterey County" in the text below. Text by Don Roberson. Photos on this page are copyrighted by the photographers to whom they are attributed, and may not be reproduced in any form (including other web sites) without the express consent of the photographer. Compared to winter 2018 — a season filled with highlights (see below) — spring 2018 was very quiet. Most regular migrants arrived late. The coast was foggy, cold, and dreary for weeks on end. 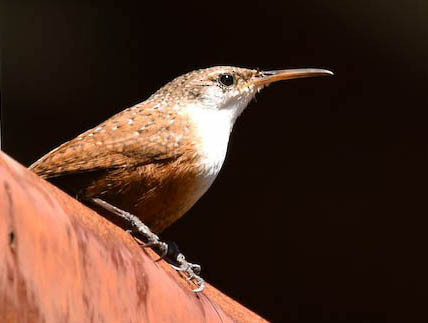 In late March David Styer found a Canyon Wren in the Impossible City on Fort Ord. "Impossible City" is a fake Middle Eastern city, built in 1987, used by light infantry troops for live fire training; the facility is still off limits to the public. Today, the Canyon Wren is its most vocal resident [left, photo 28 Mar © Shawn Wagoner]. This represents the first record for Fort Ord National Monument. Three rare wintering passerines lingered at Laguna Grande, Seaside, into April: Northern Parula to 3 Apr [R. Carratello +]; one of two Palm Warblers to 16 Apr [photo below 3 Apr, © R. Carratello]; and the Yellow-breasted Chat to 16 Apr (Paul Fenwick), completing its second full winter! One or two Brown Booby continued to be seen from Pt. Pinos — even occasionally roosting there — off and on in April and May (Mark Kudrov, Blake Matheson, Brian Sullivan). Most spring rarities were those we now expect in tiny numbers each year, such as two Black-and-white Warbler [13 Apr at MPC campus, Fred Hochstaedter; 22-25 Apr at Mission Trail Park, Carmel, Bill Hill]; two Northern Parula [one in a York Road backyard 5 May, Chris Hartzell; one singing at Andrew Molera SP 20 May, Reef Comer]; Black Skimmer [2 at Moss Landing 13 May, Sarah Lane]; and two Indigo Bunting [counter-singing males at South Bank Trail, Carmel Valley, 24 May, Rita Carratello, Michael Rieser]. Certainly the absolute highlight of the winter — and who knows, perhaps the whole year — is this juv Gyrfalcon, found by Blake Matheson on 3 Feb, and shown here gliding towards a driftwood perch at the Pajaro River mouth (photo above 3 Feb © B.T. Matheson). We never expected to see this Arctic monarch this far south on the California coast. 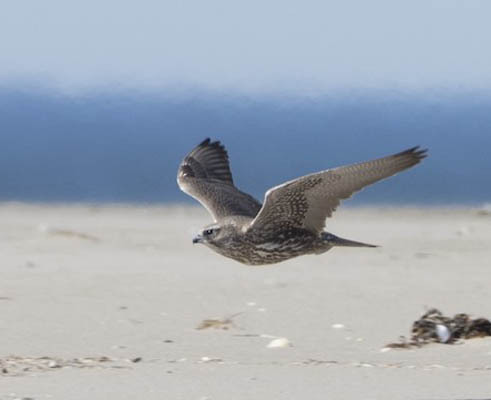 Oddly, it was a gorgeous, warm and sunny Saturday on the beach — full with families and dogs out for a stroll — and the skittish young falcon was often-flushed from perches. Eventually it took off in an amazingly strong fast flight, heading south (photo below left © Brian L. Sullivan). It flew over the Zmudowski SB dunes and didn't stop until settling on a telephone pole along Giberson Road, 1.5 miles south. Remarkably it was refound there for a short time, then was off, heading south again. On Sunday morning 4 Feb, Fred Hochstaedter found and photographed it sitting on a dune south of the Salinas River mouth — 4 more miles south — and it was photographed again later that morning on Salinas River SB, with the sea as a background (photo below right © Craig Fosdick). This was a first MTY record and only about the 12th for all of California. It is surely among the greatest birds to grace this county. We are less sure what happened next. There were scattered reports from Salinas River SB to Moss Landing in following weeks but the presence of various Peregrine Falcons of differing ages and sexes, and from different populations, clouded the situation. No reports of the Gyr after 4 Feb were accompanied by clearly confirmatory photos. Not long after discovering the Gyrfalcon, Blake Matheson found this second-cycle Slaty-backed Gull on 4 Feb near Marina (photo right 5 Feb © B.T. Matheson). We presume it also came a long distance — the nearest breeding grounds are in northeast Asia — and now represents the 5th MTY record. While all our large Larus gulls have dark eyes in their first cycle, eye color becomes much more important in second cycle and older. 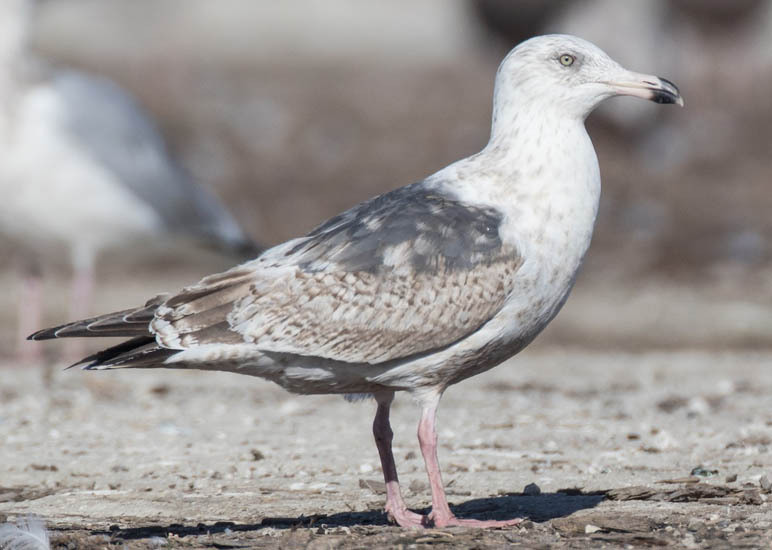 Slaty-backed and Herring Gulls are among those having bright yellow eyes at these stages of life. A spectacular wintering visitor, first found by Robert Cole on 20 Nov 2017 at his private property well upslope in Palo Colorado Canyon, is the lovely male Scott's Oriole (photo above 13 Jan © Carole Rose). 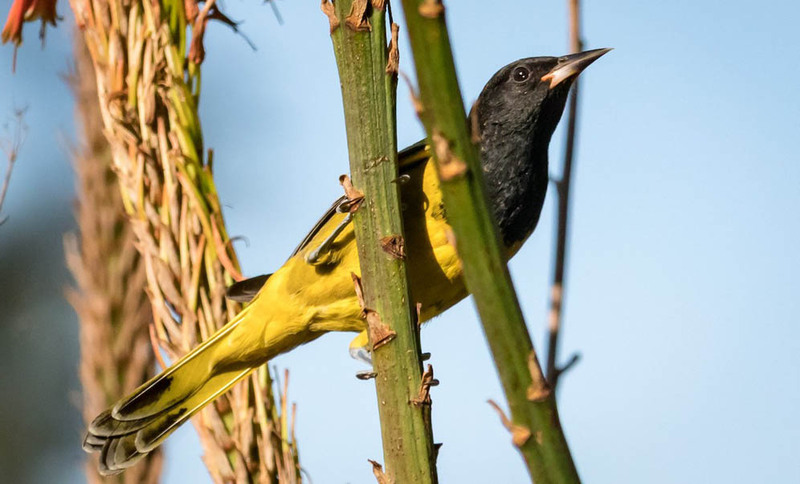 In January 2018 Bob Cole graciously arranged occasional access to his yard with its blooming aloe vera, and the oriole continued to be seen into late February. 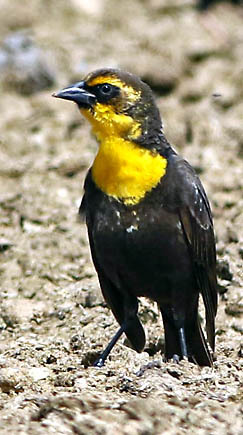 The Yellow-breasted Chat that wintered at Laguna Grande Park last year is still present (into February) for its second winter. Last year it became the first Chat known to winter in all of northern California. The Black-throated Green Warbler and the Lucy's Warbler that wintered last year did not return. However, Brian Sullivan found a new Lucy's Warbler in the restricted Odello area of Carmel River mouth that was present 30 Dec 2017-21 Jan 2018. 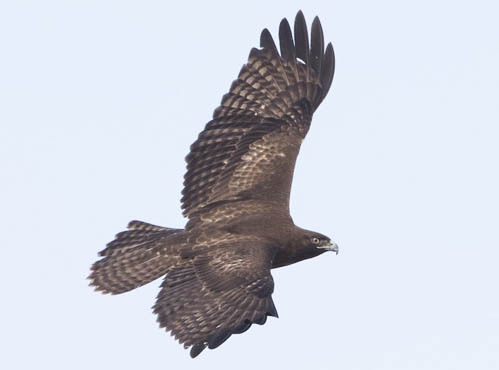 Brian Sullivan identified a juvenal-plumaged dark morph "Harlan's" Red-tailed Hawk along Lapis Road, just north of Marina, on 6 January. This is now the 4th record for MTY (photo below left, 6 Jan © B.L. Sullivan). Sullivan addressed the plumage in his eBird comments: "Very broad, wavy tail bands with typical juvenile harlani tail tip. It's unusual for a juvenile dark harlani in having solidly black outer primary tips, but in this case tail pattern trumps all other field marks. Flight feather banded in broad, like harlani too. Jerry Liguori [a well-known expert on raptors; ed.] mentions only knowing of a few other examples like this." 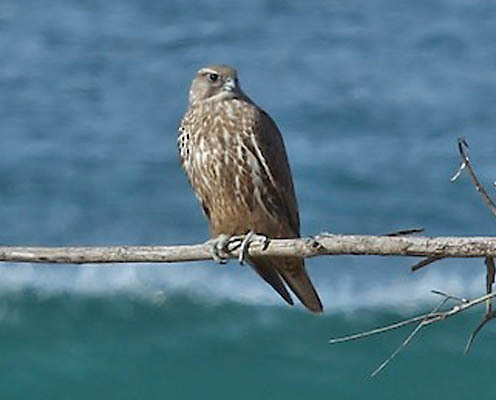 As many observers found and photographed this interesting hawk over succeeding weeks, Carole Rose noted that she had initially photographed it at the same location on 28 Oct 2017 (above right © C. Rose). 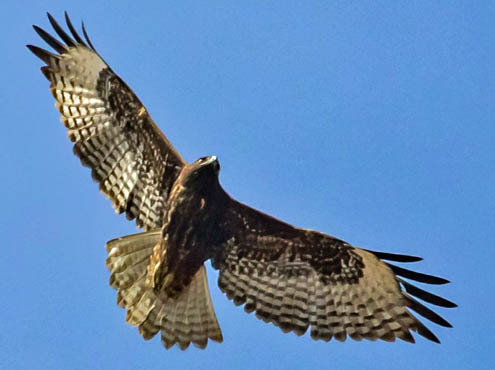 She noticed that there was a notch at the base of the 3rd primary on the left wing in Sullivan's photos (such as the one above left) and that her October hawk — thought to be a dark morph of the local population at the time — had that same notch (the left wing is on the right when viewed from below). Rita and I photographed the same bird in late February and the notch is still there. This distinctive characteristic has permitted us to expand its known dates of occurrence from late October to late February this winter. An Eastern Phoebe returned to Carr Lake, Salinas, by at least 16 Jan 2018 and was still present into Feb (photo left 3 Feb © D. Roberson). This is presumably the same phoebe present at the same site last year between 10 Dec 2016–5 Jan 2017. This individual can be elusive so full dates spans could be truncated. This is about the 15th Eastern Phoebe to winter in MTY, and the 7th to return for multiple winters. In short, about half of all MTY records are wintering phoebes, and about half of those return for at least one more winter. The champion returnee was at San Carlos Cemetery, next to El Estero in Monterey. 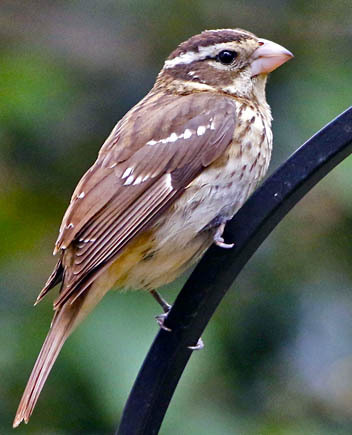 That bird returned for four consecutive winters between the winter of 1980-81 and the winter of 1983-84. Even though that was impressive, it did not set a record for life span. 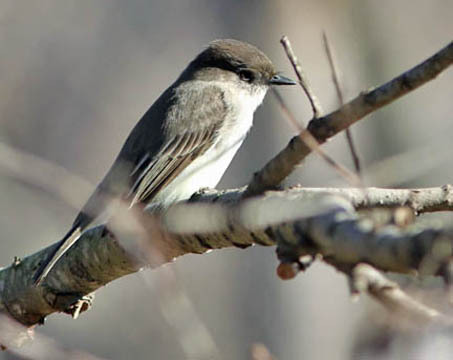 According to Birds of North America on-line, the longevity record for Eastern Phoebe is 10.3 years. 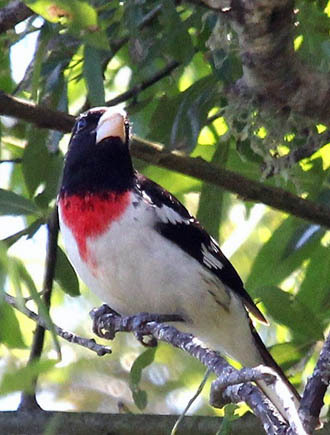 According to BNA, the life span is just 5 years, based on recapture of banded birds. But the species likely lives much longer as known ages of Western Tanager approach 8 years and at least 10 years in Scarlet Tanager. Its lengthy life (so far) is not the only curiosity this winter. 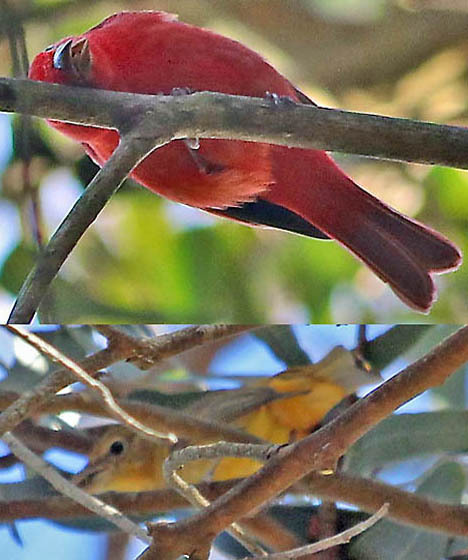 A second Summer Tanager was spotted at Asilomar on 27 Dec 2017 (Amanda Preece) and then reappeared near Monarch Grove Sanctuary from at least 9-13 Feb (photo lower right 9 Feb © Rita Carratello). 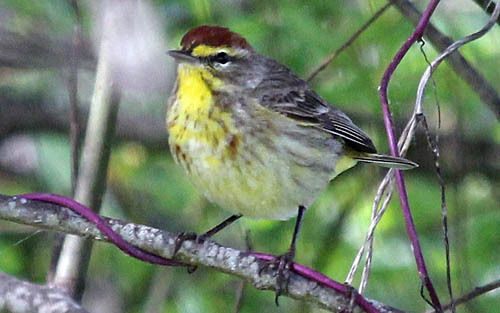 This "yellow" female-like tanager had orange in the undertail coverts and sides of neck — characters consistent with either a first-year male or an adult female. But in February this "yellow" Summer Tanager was near the male — and the male was singing up a storm! Could the old male be courting a female here in winter? And if so, what about his mate to which he presumably returns each summer somewhere to the south? 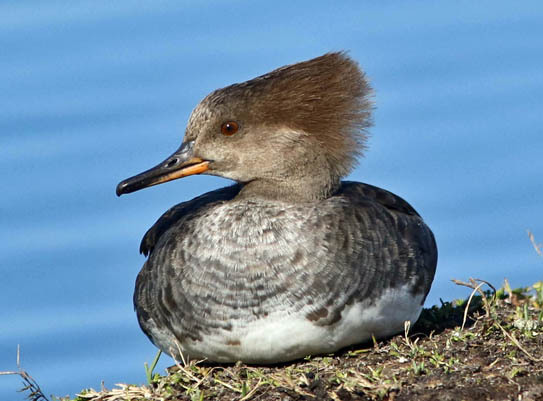 For the first time ever, a Hooded Merganser wintered on Crespi Pond, located on the P.G. golf course at the tip of Pt. Pinos. The first-winter female (dark eye) was initially discovered on 17 Nov 2017 (Paul Fenwick) and has remained now well into Feb (the photo, left, 14 Feb © D. Roberson). While Crespi pond has attracted a wide variety of waterfowl over the years, rarely has a usually shy species like this one lingered so long. With a warming climate and a series of 'warm-water' years in Monterey Bay, we have grown accustomed to reports of boobies here and there, most often Brown Boobies. More typically encountered in summer or fall, one may appear at any date. 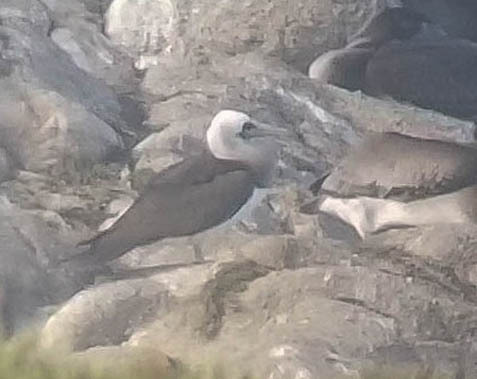 On 15 Jan, a prominently white-headed Brown Booby flew past a whale-watching trip off Cypress Point (photo below left © Jodi Frediani, courtesy Monterey Bay Whalewatch). 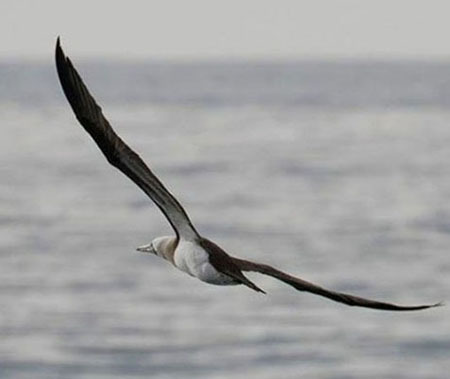 The white head and nape identifies this as an adult male Brown Booby of the subspecies brewsteri, which breeds on Revillagigedos Islands off Baja California and on islets in the Gulf of California (and since 1999 on the Islas Los Coronados just south of the U.S.-Mexico border southwest of San Diego). There were a couple of reports of adult male brewsteri in Monterey Bay some 20 years ago, but this is the first in a long time. Equally remarkable, this same adult male flew by or roosted at Pt. Pinos off and on during 5 different days between 15 Jan–1 Feb (photo below left 19 Jan © Paul Fenwick). The year 2018 began with a few fine rarities still wintering locally. Chief among them was this Louisiana Waterthrush along the Big Sur River in Pfeiffer-Big Sur State Park (photo below, 2 Jan © D. Roberson). Found on 23 Dec 2017 by David Dovalina, it attracted State listers from throughout California. It had become less predictable at its usual locations in January and was last reported on 14 January. 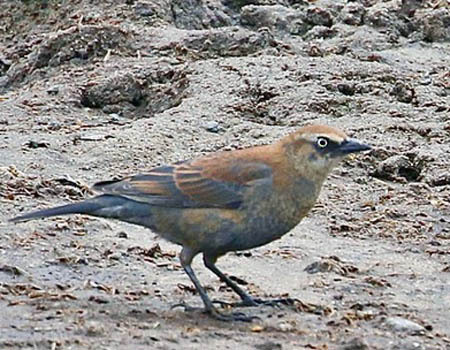 Excellent finds in the new year included a Rusty Blackbird at Moonglow Dairy, found 13 Jan by visitors chasing the waterthrush, Logan Kahle and Bob Toleno (photo above left 14 Jan © Kent Van Vuren). All of our prior county records of Rusty Blackbird had been lone blackbirds away from the swarming hordes of other blackbirds, so its occurrence at Moonglow Dairy was an unexpected first there. With the mixed flocks of blackbirds, cowbirds, and starlings reaching 5000 at Moonglow, it proved elusive to refind, yet was relocated in mid February (Scott, Linda, and Ryan Terrill, et al.). This is the 9th MTY record; the most recent was in Oct 2013. 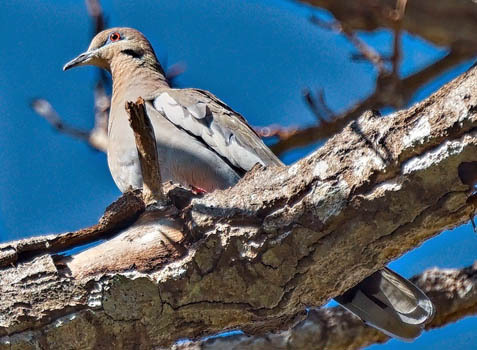 Also unusual was a wintering White-winged Dove found by Michael Rieser behind the Carmel River Inn from 21 Jan into Feb (photo above right 21 Jan © M. Rieser). While one or two White-winged Doves in MTY each year have become semi-expected, wintering individuals are much scarcer, with only 4 prior winterering doves. One of those was also at Carmel R. mouth (31 Dec 1995-1 Jan 1996; Bill Reese et al. ).